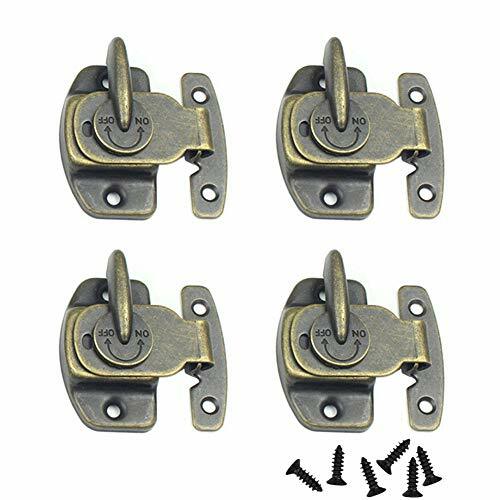 CGMJ 4 Pack Table Buckle Dinning Table Locks Connectors Hardware Accessories (Bronze) by CGMJ at Oakdale CC. MPN: 0008. Hurry! Limited time offer. Offer valid only while supplies last. 100% brand new and high quality. Mounting screws are included here for easy installation.Sturdy and durable.Package include: 4 * table buckles. Mounting screws are included here for easy installation. Package include: 4 * table buckles. 1.Please allow 0.1-0.5 inch error due to manual measurement. 2.Please be reminded that due to lighting effects and monitor's brightness/contrast settings etc., the color tone of the website's photo and the actual item could be slightly different. Size: 70mm * 34mm * 22mm/2.75" * 1.33" * 0.86"(L * W * H). Lock and unlock tables in an orderly fashion with a sturdy latch and handle design. Aligns table leaves and keeps them firmly locked together. It is good for keeping tables from drifting apart, maintaining neat and orderly, performs better on tables that have opposite angles. Applicable to table, wooden case, cabinets, drawers, cupboards and other furniture. If you have any questions about this product by CGMJ, contact us by completing and submitting the form below. If you are looking for a specif part number, please include it with your message.